Marriage, seems to be the topic people are tired of hearing about, yet want to continue talking about. 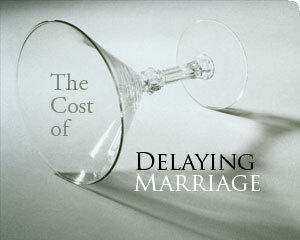 I think this topic rose to fame and has remained a favorite in the western Muslim community because of how difficult it has become; getting married (the halal) at this time is difficult, while temptation (and haram) by its very essence is easy. Many youth feel that they are ready to get married, but face a number of obstacles (all of which I could not enumerate or recognize as every sister’s circumstance is different, but I would guess family is one of the more common issues faced). To digress for a moment here, I remember many years back, my friend and I had gone to the video store with her little sister and nanny. My friend’s sister ended up wanting a toy which the nanny said she couldn’t have, and so she was crying about the toy all the way home. The same happens with chocolate – we might tell ourselves "no more chocolate for this week," and then end up thinking about chocolate more than we do in the first place. This is essentially what happens when you want something which you are told you can’t have until a later date ,you think about it. By the same token this happens with the issue of marriage. Some youth are interested and can’t go ahead with it and then have it on their mind constantly trying to drive the thoughts away. So, what can youth in this situation do? Firstly, it’s a good time to remember that marriage is a means, and not an end. Think about it, is your purpose in life to get married? Will you be 100% happy and trouble-free when you get married? The answer to both questions is no. We all know our purpose is to worship Allah Subhanahu wa Ta’ala. And, it’s not like after you get married, you and your husband will joyfully skip into the sunset and it’s happily ever after. Pure happiness, peace, and tranquillity can only be found in Jannah. Which brings me to my next point – let us not forget about what we really should have on our mind and be striving for, Jannah. To reach the final abode! Questions started popping into my mind: why did I want to get married? What is marriage a means for? What is the end? They like the idea of being loved, having a family, etc. The first point should be the primary reason we want to get married, while if there are any other factors they should be secondary to that main one. What is marriage a means for? In relation to the previous question, once you set your main intention in order, you realize marriage is a means to complete half your deen. It is a tool for raising a family upon the religion in obedience Allah Azzawa Jall. And increase and better yourselves together. Ultimately all this is to please Allah Subhanahu wa Ta’ala and gain Jannah bi’ithnillah. Thus, we now see that the main goal in our lives shouldn’t be to get married, but to live life in such a way that we can insha’Allah have the Mercy of Allah Azzawa Jall reach us. The end we want is Jannah (Jannatul Firdaus, insha’Allah)! So we’ve got all that sorted but you still can’t get married…what do you do? If it’s really not possible for you to get married at the moment, for whatever reason, then there is no point in obsessing over it and thinking about it every moment. If we consider the current situation rationally, we need to ask ourselves: is thinking about it going to change the circumstances? Nope. Accept the reality and stop ‘scouting’ out prospects X years in advance. Put your head down, and occupy your time with good deeds and activities that will please Allah Subhanahu wa Ta’ala. I’m not saying that you won’t think of marriage for the next X years, you will naturally think about it occasionally, but insha’Allah it won’t be on your mind 24/7. Busy yourself with ibadaat, learn more about your deen (there are so many books that one can read insha Allah wa mash’Allah), memorize Qur’an and understand tafsir, volunteer, get involved in projects serving the deen (online or in person), hold fundraisers, etc. And finally, work on yourself, for the sake of Allah AzzawaJall and your akhirah. Our love for Allah AzzawaJall, and then the Prophet sal Allahu alayhi wa sallam, and Jannah should be greater than our love for other humans in this dunya. Make the deen your life and focus. You may still get whispers from Shaytan telling you to impress that brother, but fight away those thoughts and keep on marching forward insha Allah. On the Day of Judgment, you will stand alone with your character and deeds, so don’t lose sight of death and the akhirah. I would like to briefly address the sisters who believe that they are ready for marriage and can eventually convince their parents (gently and respectfully) or overcome the hurdle that is stopping them. My advice would be to go for it! Marrying young is the sunnah, and if you can marry, then why not? Start researching, learning, and reading books about marriage in Islam, its obligations and sunnah, evaluate yourself and what you realistically want in a spouse. And of course do istikhareh prayer before you make any big decisions. that is so true! Marrying young is sunnah and it is healthy ...my heart goes to all my girlfriends who delayed marriage for many reasons (school, not the right one, etc..) and find themselves now in this fitnah where no one match. I really liked this article. Very encouraging for those who are worried about getting married late :) JazakAllah khayr sister Amal. SubhanAllah how this article spoke to me about the situations I've faced and the situation im currently facing. It really is hard to get married for the mentioned and unmentioned reasons above but subhanAllah how things work out in ways we never think possible. Walaykum asalam wa Rahmatu Allahi wa Barakatu. "Rabbana hab lana min azwajina wa dhuriyyatina qurrata A'yunin waj'alna lil-muttaqina imama." "Our Lord! grant us in our mates and offspring the joy of our eyes and make us patterns for those who guard against evil." (25:74) .. Please pray for all the ladies who are above 30years of age and are not married..